Tom Spilsbury talks to former showrunners, Russell T Davies and Steven Moffat about adapting their stories, ‘Rose’ and ‘The Day of the Doctor’ into novels. You can get copies of these stories and others from internet. An outstanding metal cover of the To save Gallifrey theme from The Day of the Doctor? Interview from The Doctor’s Finest with Hannah Hart and Ingrid Oliver. Osgood’s return in series 9 should be very interesting, especially if she really is dead. But I kind of doubt that – that means that Missy should be dead also, and she is back too! Steven Moffat discussed what ‘The Day of the Doctor’ almost was when no Doctors were available for filming! They only had Jenna Coleman on contract, and no Doctors available at all! But she worked it up fine, right? Let's Get Out Of Here! : Maniacal Movie Poster Monday #177! This is a little project TheFallofTheEleventh put together for his little cousin, Ben, because he loves power rangers and Doctor Who and he asked the author to share it with you all. So, don’t mind and please enjoy! Excellent news: earlier tonight the Doctor Who special episode, The day of the Doctor, won the only award at the TV Baftas decided by the public, the Audience Award, that was voted by readers of RadioTimes.com during April and early May. The special episode was written by showrunner Steven Moffat and saw off stiff competition for the prize in the shape of Broadchurch, Breaking Bad, Gogglebox, Educating Yorkshire and The Great British Bake Off. No words are necessary for this well known and loved scene from The Day of the Doctor. This fan made film re edit the scene where all the 13 Doctors come together with some additional frames from other episodes of the show. BBC proudly announced that Doctor Who and Peaky Blinders have each won two honours at the Bafta Craft awards: An Adventure in Space and Time won for make-up and hair while 50th anniversary episode The Day of the Doctor won for special, visual and graphic effects. The gangster drama Peaky Blinders won best director for Otto Bathurst and best photography and lighting. Actresses Victoria Wood, Emilia Fox and Patsy Palmer were among the stars who attended the ceremony in London. More information (if you are interested) can be found here. Some have expected that this hilarious pre-movie introduction should be on the disc with the Day of Doctor because they watched it in theaters. One of this fans found some videos on Youtube, edited them, and uploaded the result on his channel. The 50th Anniversary Trilogy took place in 2013 over three amazing episodes: The name of the Doctor, The day of the Doctor and The time of the Doctor. This is a fan-made trailer for the trilogy! In the case you didn’t find out yet, hear this out: the anniversary episode broke some world record… Doctor Who show runner Steven Moffat was presented with the Guinness World Record for the largest ever simulcast of a TV drama, after The Day of the Doctor was broadcast in 94 countries across 6 continents on Saturday 23rd November 2013. The surprise award was presented live on stage during a panel with Matt Smith, Jenna Coleman and The Day of the Doctor director Nick Hurran at the official Doctor Who 50th Celebration. First day on the front line? Time to attach a Headcam for a soldier’s point-of-view. What could possibly go wrong? This video is a part of the Doctor Who 50th Anniversary Collection. Yes, yesterday was indeed the day of the Doctor. It was the 50th anniversary from the broadcast of the first episode, thing that happened almost unnoticed because of John Fitzgerald Kennedy’s assasination one day before. But a hard start did not stoped the people from the BBC to produce episode after episode, and now, 5 decades later, to produce n episode about the first 3 years of the show and the first Doctor, William Hartnell. An adventure in time and space was broadcast Friday, 22th of November, and it can be describe in one single word: memorable. The British work made the idea to endure and to become a world wide phenomenon. Last night BBC and some cinemas around the world broadcast the special episode the Day of the Doctor, an episode well done. The history from the Doctor Who Universe says that once there were a temporal war between the Time Lords and a race called the Daleks that burned everything in its way in the universe. The war ended in the moment the Doctor eliminated both rases along with his home planet, Gallifrey, into an attempt to save the rest of the Universe. To do that he stole a weapon called the Moment, something so powerful its operating system became sentient, and the Time Lords could not used it even in the last moments of the war, when the odd were against them. Who could use a weapon of mass destruction that could became his/her judge of the war crimes? That moment was probably the worst moment in Doctor’s life, so bad that he overlooked or even forgot some things. The John Hurt’s incarnation was considered that Time Lord that betrayed the name of the Doctor. The day of the Doctor returns to that moment in time and space, bringing along several incarnation of the Time Lord: John Hurt, David Tennant (the Tenth Doctor), Matt Smith (the Eleventh Doctor). 3 Doctors working together, 3 times greater nightmare to their enemies, including the Daleks. The current companion, Jenna Coleman (Clara) and Billie Piper (known as Rose Tyler or Bad Wolf) are also present. But Tom Baker too, the Forth Doctor, at the end of the episode. I am not telling you the details of the great story written by Steven Moffat, it has too many turns (more or less unexpected) in the action. If I am starting to write the good or the best stuff that appeared in the episode I will only take you the pleasure and the surprise of watching the show. All I can tell you is that the Zygons, shape-shifting creatures that return in this episode of Doctor Who, provide an important item that help saving the planet Gallifrey and its natives from destruction. So that the Doctor will be able to return home some time in the future. Watch two exclusive extended Inside Look from BBC America at “The Day of The Doctor,” the Doctor Who 50th Anniversary Special. The first video contains never-before-seen interviews with Eleventh Doctor Matt Smith, Tenth Doctor David Tennant and series Lead Writer & Executive Producer Steven Moffat. The second video contains never-before-seen interviews with Eleventh Doctor Matt Smith and Companion Jenna Coleman. Steven Moffat talks about bringing back the Daleks for the Doctor Who 50th Anniversary Special, The Day of the Doctor. Watch the second official trailer for The Day of the Doctor, the Doctor Who 50th Anniversary Special, airing globally at 7.50pm GMT on November 23. David Tennant provides a spoof introduction to Doctor Who’s 50th Anniversary Special, The Day of the Doctor… this Saturday. Sitting backstage, the tenth Doctor talks fans through what they can expect in Saturday’s highly anticipated special, sensationally revealing that not only will the episode be CGI-free but also that he will be spending most of his time with a red, plastic space hat on his head. A special report from Lizo Mzimba on the set of the Doctor Who 50th Anniversary episode, The Day Of The Doctor. Have you ever wanted to see David Tennant threaten a rabbit? Well, today’s your lucky day as the BBC releases a behind-the-scenes set report, featuring new clips from the Doctor Who 50th anniversary special, The Day Of The Doctor. The video, which aired on BBC Breakfast this morning, teased such scenes as David Tennant’s tenth Doctor mistaking an innocent rabbit for some sort of clever alien disguise and David Tennant, Matt Smith and John Hurt’s mysterious Doctor being surrounded by what look like Elizabethan soldiers. Another Children in Need happened last night, another record pledge with £31,124,896 raised so far thanks to the efforts of Pudsey and friends. Led once again by Sir Terry Wogan, the 34th annual fundraiser edged ahead of the £26.7 million raised at the end of the night last year. You can find more information about it over here. <b>Doctor</b> Who News: <b>Children in Need</b>: Cometh the <b>Doctor</b>! A crashing spaceship, a desperate pilot and an ancient world all lead the Doctor towards a terrible choice in this 50th anniversary mini episode… The eighth Doctor, Paul McGannm seen only once before in 1996 outing Doctor Who: The Movie, stars in the mysterious mini-episode The Night of the Doctor. The short film starts with McGann’s Doctor hurtling through space in a doomed ship accompanied by a woman called Cass. The Bringer of Darkness, the Oncoming Storm, the Doctor, the Warrior – A Time Lord! 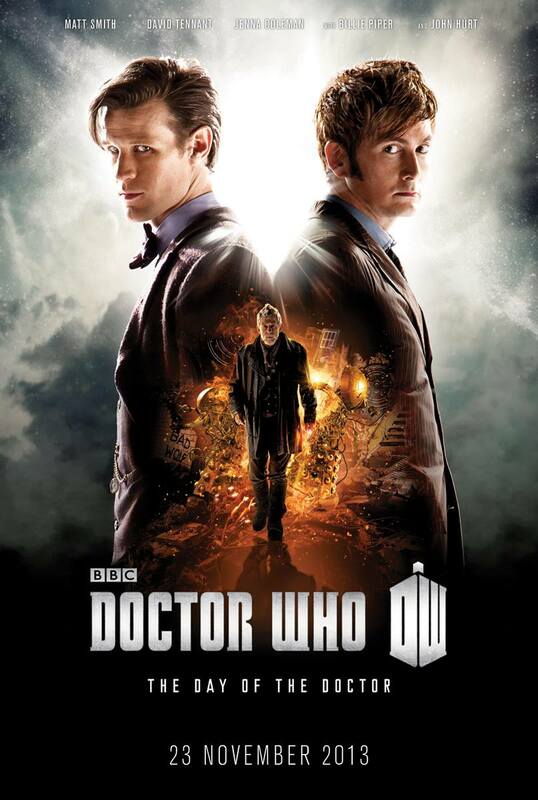 The 50th Anniversary features Matt Smith, David Tennant and a mysterious incarnation played by John Hurt. Only one appears in the mini episode, The Night of the Doctor. But which one? Watch the episode and find out. Strax’s field reports are back! The Sontaran commander reports on The Day of the Doctor and the return of the Zygons! 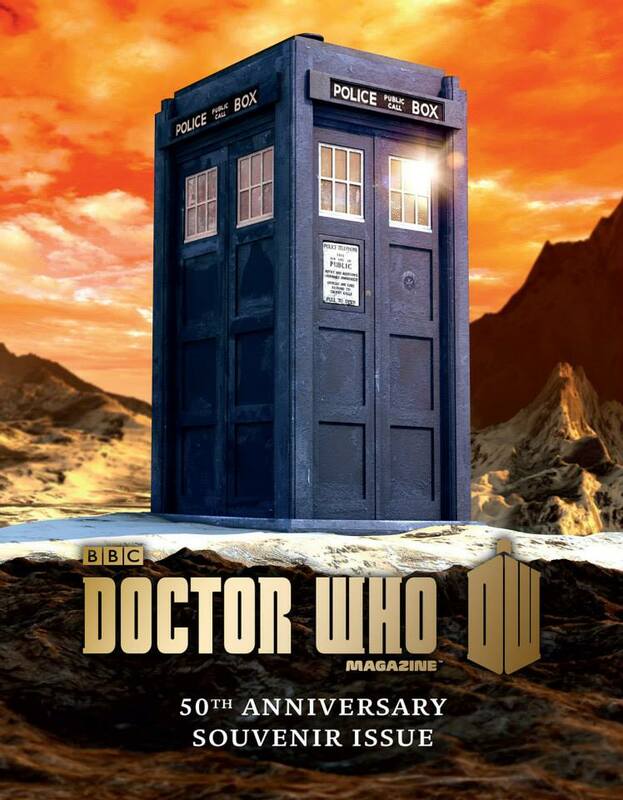 In order to celebrate the 50th anniversary of Doctor Who, Doctor Who Magazine issue 467 is the biggest one ever, at 116 packed pages! It also comes complete with a very special 1960s-themed mini issue, which imagines how DWM might have celebrated the series’ first anniversary. Plus, there is also a set of 12 amazing art cards, featuring all 12 Doctors, and nine free audio downloads of Doctor Who stories! DWM issue 467 will be out Thursday 14 November, price £7.99! Go get it! Matt Smith and David Tennant – two Doctors interviewed together! The Day of the Doctor – a preview of the 50th Anniversary Special, with exclusive new photographs! An Adventure in Space and Time – huge behind-the-scenes feature! A fascinating feature on Anthony Coburn – Doctor Who’s greatest unsung hero! An Unearthly Child – the draft scripts of Doctor Who’s very first episode revealed! The Watcher’s Guide to Anniversaries! The Five Doctors – a fascinating guide to Doctor Who’s 20th anniversary adventure! Mary Peach – the guest star of The Enemy of the World reacts to the story’s recent recovery! John Smith and the Common Men – a special anniversary comic strip! The Time Team watch Last of the Time Lords and Time Crash! The Watcher’s 50th Anniversary Quiz! The trailer stars the two Doctors – Matt Smith and David Tennant – together for the first time with the now-iconic fez and Amy’s glasses.Their companions, Jenna Coleman as Clara and Billie Piper as Rose, also appear in the footage, as does Joanna Page as Queen Elizabeth I. And the Daleks are out to “EXTERMINATE” once again. The jam-packed edit comes to a close with Rose informing John Hurt’s character, “The moment is coming,” to which he replies, “I’m ready,” before Matt Smith yells “Geronimo” from within the Tardis. A sneak peek from the Doctor Who 50th Anniversary special, The Day of the Doctor: The Doctor and Clara are shown something that doesn’t seem possible. The episode is 75 minutes long. You can check out our list of the over 75 broadcasters who will be screening the episode simultaneously, alongside selected cinemas worldwide. Celebrate 50 Years of DOCTOR WHO with this specially-shot tribute in advance of the special 50th Anniversary episode, “The Day of The Doctor” *** Premiering SAT NOVEMBER 23 *** on BBC AMERICA. The Day of the Doctor stars Matt Smith (How to Catch a Monster), David Tennant (Broadchurch), Jenna Coleman (Dancing on the Edge), with Billie Piper (Secret Diary of a Call Girl) and John Hurt (Tinker Tailor Soldier Spy, Alien). Enjoy watching the specially-shot trailer for the 50th Anniversary adventure The Day of the Doctor, featuring all of the Doctor’s incarnations and a selection of his friends and foes. November 23rd is The Day of The Doctor and time is up for the Last of the Time Lords, you can’t run forever. Trapped inside his own time stream with Clara by his side, the only way The Doctor can free themselves is by unlocking his darkest day: The Time War. Some of you may notice the use of song ‘Line of Fire’ by Junip from the trailer made to advertise the end of AMC’s frankly genius Breaking Bad, which ended last Sunday. By the way… this video is a fake-but-grand trailer for “Day of the Doctor,” from YouTube team VG934. The title for the Doctor Who 50th Anniversary Special was revealed earlier today, it’s The day of the Doctor. The Eleventh Doctor, Matt Smith, will join David Tennant and John Hurt as the Doctors. It’s true, we still don’t know which incarnation of the Time Lord is John Hurt, but I think we will found out soon. Both companions Billie Piper and Jenna Coleman will be involved in the story. The celebratory episode will be feature-length, it was announced to be 75 minutes long, not 90, as many have expected, and it will air 50 years to the day since Doctor Who first hit TV screens, on Saturday 23 November. The story is also set to feature the return of classic Who monsters the Zygons, as well as Daleks, Cybermen and the Doctor’s allies UNIT. The image is the official poster of the episode.